The design and operational requirements of a mooring arrangement for floating wave energy converters are significantly different to those of a typical offshore installation in terms of 'static' and 'dynamic' motions. A motion dependent wave energy converter needs to have a natural response frequency at the dominant wave frequency, and the mooring system needs to be designed around this. In contrast to conventional floating offshore installations, wave devices are installed in shallower water, typically at the 50m contour, for which both tidal changes and currents can have a proportional larger effect on line lifting. When an array of devices is considered, the limitations in sea space may require that the devices be relatively densely packed and, as a consequence, the 'footprint' of the mooring may be constrained to ensure that the moorings from each device do not interfere. 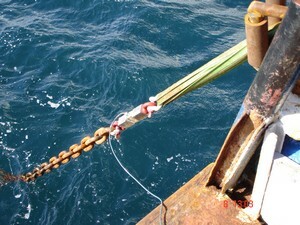 This has great significance on possible mooring line length and axial stretching due to mooring line lifting. The design of moorings for a wave device must not only consider reliability and survivability, but also the need to preserve efficient energy conversion. 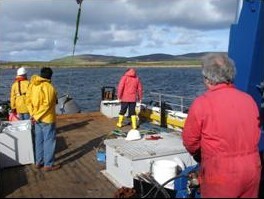 Tank testing at small-scale was used to investigate the response of a single mooring line for surge motion, with particular emphasis on the effect of axial stretching, and the influence of the top end motion on dynamic response. The laboratory procedures were designed to resemble proposed tests at large scale in 24 m water depth (in WP10), and measurements were compared with output from numerical models. 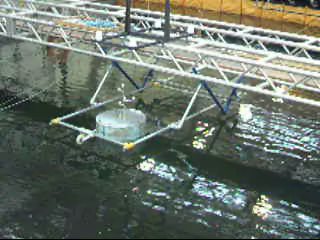 The work has shown that both the axial stretching and the top end dynamics have an important influence on the station keeping of floating wave energy converters. The relevance of non-linear behaviour of the mooring line was shown to be a major influence on the station keeping of a device, particularly in terms of loading, stiffness and damping characteristics. The strain on the mooring line and components resulting from non-linearities increase both ultimate peak load, and also fatigue damage from higher levels of accumulated cyclic loadings. This work suggests that compliant chain mooring arrangements relying on the submerged mass of the line to provide the restoring forces are not able to restrict horizontal movements in an efficient manner for arrays of floating wave energy converters. The results highlight the potential for taut-mooring applications where pre-tension provides the restoring forces. This would imply the need for innovative design solutions to allow the required compliance to account for variations in tidal level. Non-linear effects have been shown to be fundamental to the understanding of device response and must be considered in any detailed design of the station keeping system, and its influence on peak loading and energy conversion efficiency.